The New Orleans City Council gave enthusiastic approval to a plan to remodel the former Blockbuster Video building at the edge of the Garden District into a CVS pharmacy, but several members said the city should be looking for a way to restrict the growing density of chain stores on Magazine Street. The discussion of the CVS at Magazine and Louisiana began with a fairly congenial discussion of the plan for the store. The building originally housed an Eckerd’s Drug Store, but the developers needed city permission to reunite all the floor space (currently divided into several units) in the building into a single business of more than 5,000 square feet. Attorney Michael Sherman, representing CVS, said that the building will get a complete redesign, based in large part on input gathered in “countless meetings” with neighbors and city officials. New Orleans “isn’t a city with neighborhoods but a city of neighborhoods,” Sherman said, and added he was particularly grateful for the suggestions of local architects who live near the site. “What we’re ending up with, thanks to the work with the community and the city planning staff, is a really beautiful building that looks like it belongs on Magazine Street,” Sherman said. City Councilwoman LaToya Cantrell also noted the improvements to the building. CVS is still working out the final details of a good-neighbor agreement with the Garden District Association, one Sherman described as among the most comprehensive he’s ever seen. Shelley Landrieu of the Garden District Association said they were still negotiating some issues such as the hours for security guards, but agreed that the process is “very close,” and Cantrell said she would hold the ordinance allowing the CVS until that agreement is signed. The primary practical concern expressed by many residents around the CVS — including one speaker on Thursday — is whether the sale of alcohol at the store will lead to increased crime in the neighborhood. City Council president Stacy Head said, however, that she lives near the CVS on Prytania and that it is “incredibly well run,” safe and a benefit to the neighborhood. “It’s all about how the business chooses to operate,” Head said. Head’s concern — not for this CVS in particular, but as a general trend — is that so many national retailers are moving onto Magazine Street and intensifying the uses there, she said. San Fransisco, for example, requires all chain businesses to seek a conditional-use permit from the city, which may deter some chains from even attempting to open, according to a 2013 article at Salon.com. What New Orleans needs, Head said, is a constitutional way to define a “saturation point” for chain retailers on the city’s business corridors. Meanwhile, Cantrell concluded, the city also needs more general improvement on Louisiana Avenue, and she hopes the eventual conclusion of the new SELA drainage canal project will be a springboard for that. With that, the council voted without opposition in favor of the CVS. Sorry, I think it’s a ridiculous location with a CVS at Prytania and Upperline, a Rite Aid at St Charles and Louisiana, and a Walgreens at Pleasant and Magazine (2 blocks from the proposed CVS)…….I wish JoAnn’s Fabrics and Crafts had had the foresight to utilize that strategically located building……or, maybe, Jos. A. Bank Clothiers. No problem. Just change the name of part of the street, and there won’t be so many chain stores on Magazine Street. Why can’t these big corporations invest a little money into a decent architecture firm…chains on Magazine St. would be much less of an issue if they actually used their resources to contribute to the visual & architectural fabric of the city. Rather than wasted corner after waste corner of potential to showcase good design. Freret Neighborhood, maybe we can get some ideas from the Garden District on the “Good Neighbor Agreement”. Let’s learn from each other. 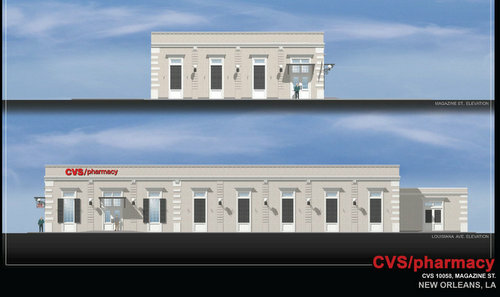 This CVS required exactly that, a conditional-use permit to be approved by the City Planning Commission. While requirements like this may be a suitable obstacle in San Francisco, the CVS request passed last month with a unanimous vote by our very own City Planning Commission. Perhaps the Commission should reexamine their charter and seek to do something besides rubber stamping every request that hits the docket for fear of offending someone.